SUMMARY - Strong dynamics associated with deepening low pressure system. There are flashy parameters with this fall system. Recent model runs have trended slower and further west with the low pressure system. 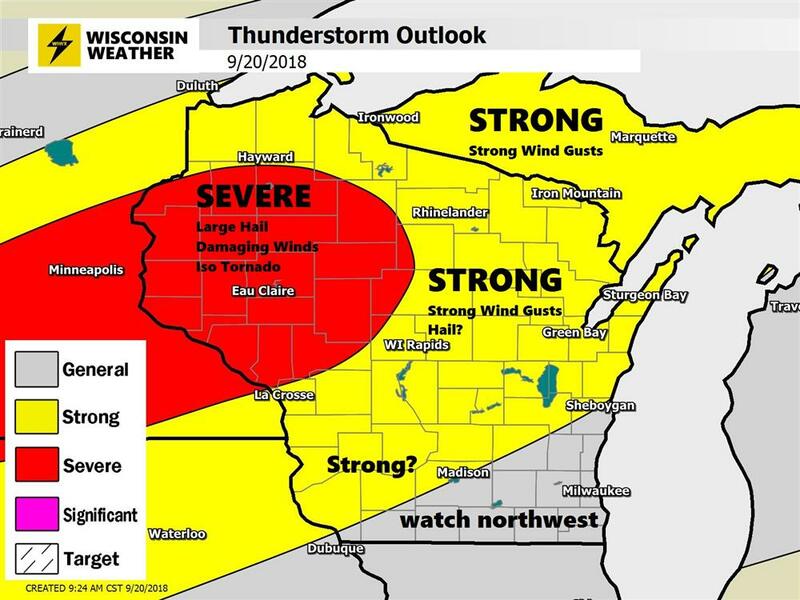 This shifted the severe risk towards the west and is now centered on southeast Minnesota. 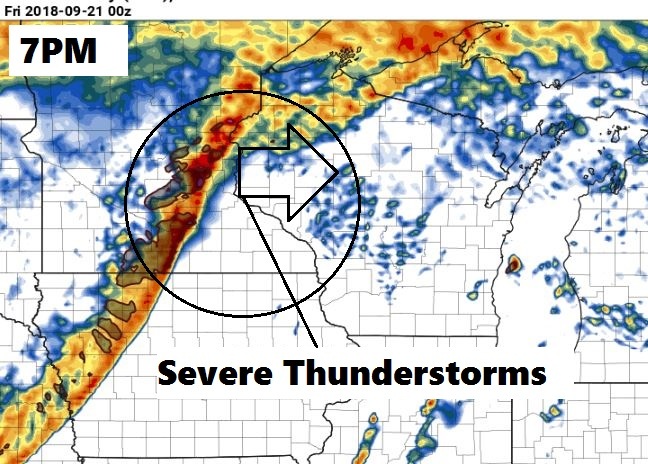 SEVERE T-STORMS - across southern Minnesota and northwest Wisconsin 50kt+ veered bulk shear, 2000 MUCAPE along the warm front, cold front approaching from the west and upper level jet support. An elevated supercell or two during the afternoon hours will present large hail and damaging wind risk. 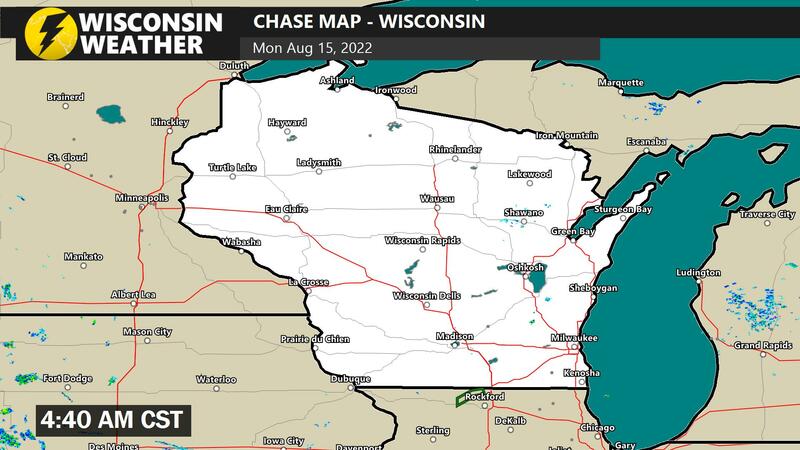 Late this afternoon a line of storms will fire along the cold front in Minnesota and arrive in northwest Wisconsin after dark. All modes of severe weather is possible including one or two tornadoes once the storm line interacts with the surface warm front. 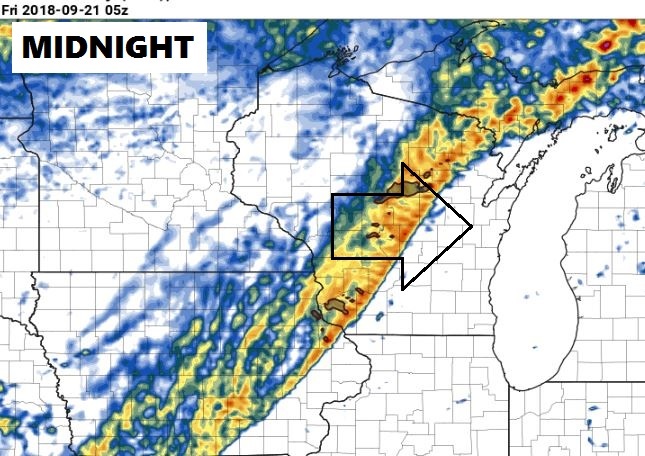 Line of thunderstorms make it into eastern Wisconsin overnight, then wash out. 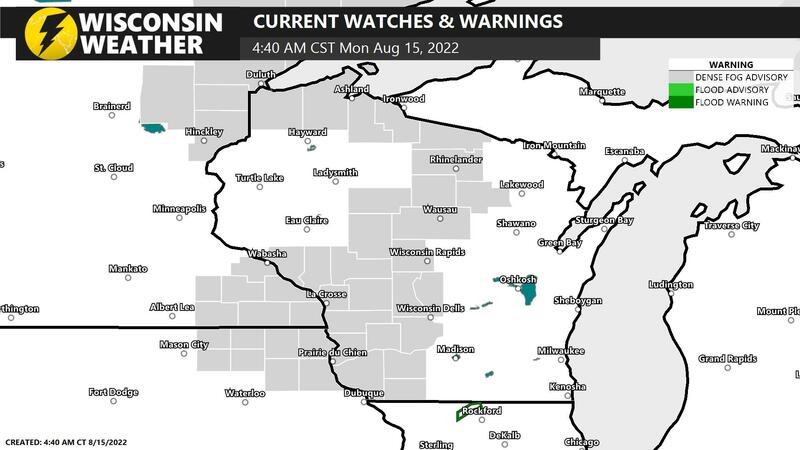 Will be watching the maintenance of a linear storm structure overnight eventually washing out in eastern Wisconsin overnight. Windy conditions ahead of the line, plus strong dynamics behind it; will make it fairly easy to create strong thunderstorm wind gusts on passage even in a limited or elevated thermodynamic environment. Didn't want to overlook this aspect of the system which would be more widespread than severe risks in the northwest. 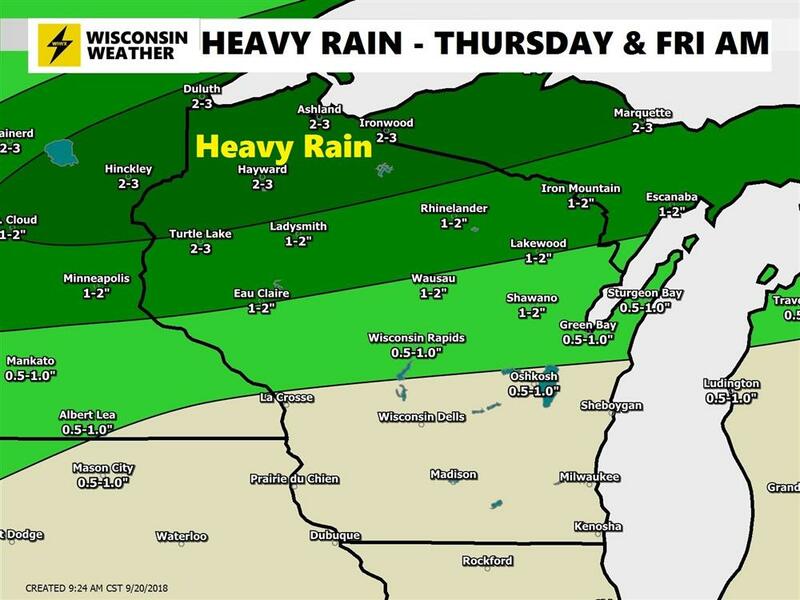 HEAVY RAIN - Widespread rainfall of 1-3" in portions of northern Wisconsin with locally higher amounts potentially exceeding 3". Heavy rain accumulation thru Friday 7AM. WIND GUSTS - Increasing non-tstorm wind gusts of 30-40 MPH are possible Thursday night during low pressure passage. 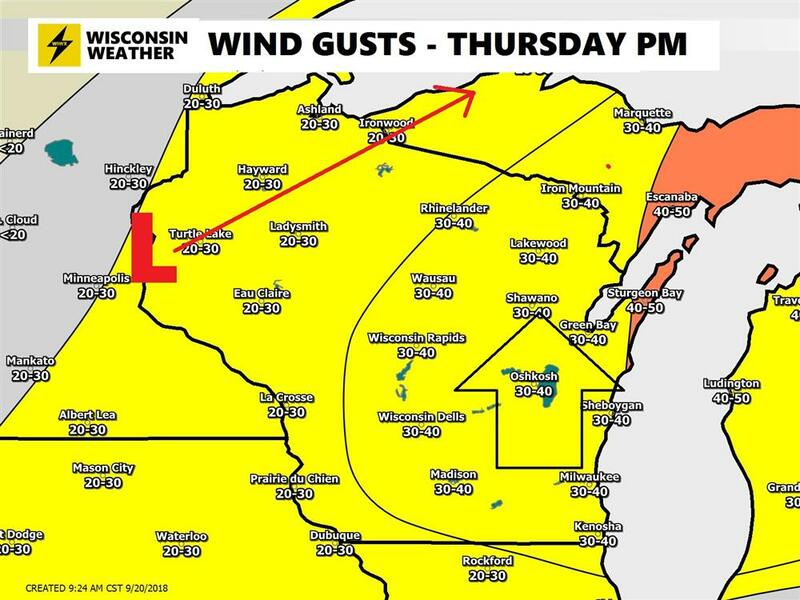 The strongest winds over the open waters of Lake Michigan and Superior. Maximum wind gusts through 7AM Friday.